Welcome to the 4th Edition of the epic Role-Playing Game Legend of the Five Rings. Join us for the ultimate adventure of fantasy samurai, locked in perpetual battles of honour and glory within the bonds of the Code of Bushido. The Emerald Empire of Rokugan demands much of its samurai: service to one's lord, service to one's Clan, and service to one's Emperor. Bushido's staunch and unyielding code of conduct binds samurai to duty, strengthening their character and defining their choices. While some samurai serve the greater good, others use the strictures of Bushido to manipulate the lower ranks and advance their own power. Will you follow honour or reject it? The choice is yours. Eight Great Clans form the heart of Rokugan's culture. Each is defined by its own principles, values, and agendas. Each sees the Code of Bushido in its own way. Each seeks to serve the Emperor with its own unique talents. 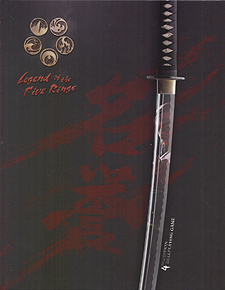 Take up the soul of your ancestors - the samurai's daisho - and fight for the glory and honour of your family and Clan. Now is the time for heroes, in a world where Honour is a force more powerful than Steel. A game unlike any you've played elsewhere. Honour and service are valued more than magic swords taken from wandering ogres. Prepare for the glorious life of the samurai. A unique, comprehensive character sheet. Legend of the Five Rings rules have never been more easy to learn and to play. No more need to flip through pages of rules while fighting your enemies. A toolbox approach to role-playing in Rokugan. Fourth Edition encourages gamemasters of Legend of the Five Rings to customize their game, adding or removing from their campaigns as they see fit. A broad history of the Emerald Empire and the beliefs of all the Great Clans, with play options not only for the major clans but also for outlying groups such as Imperials, Minor Clans, and the infamous Spider Clan. Draw your blade and join the fight for Rokugan.